Well, it's official. Last Friday, the FTC gave a "thumbs up" to Universal Music Group, allowing the company to move forward with it's acquisition of EMI's recorded music division. Needless to say, this has sparked a lot of discussion and debate within the music industry. Many feel that, even with UMG's planned divestments, this approval puts too much power into the hands of UMG. Controlling such a large percentage of music copyrights could suppress healthy market competition, affecting the diversity of choices that consumers are exposed to as well as the prices they pay for this music. Similarly, UMG could have much more of an influence on the success of new music technology services as they decide whether or not to license music to that service, and if so under what terms. The American Association of Independent Music (A2IM) has been outspoken in their position against this merger. They recently posted a response to the FTC's announcement standing by their position, and linking through to more in-depth explanations about the negative effects this merger will have on the industry. Of course, UMG and other parties with aligned interests (i.e. Live Nation) see things differently. 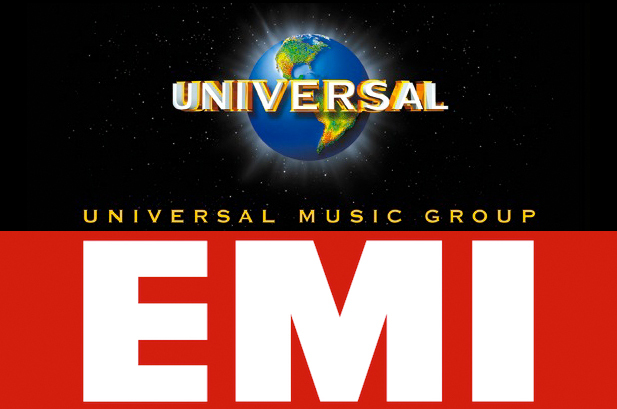 According to Lucian Grainge (CEO of UMG), "EMI has been underinvested for a long while", and he intends to pour a lot of money back into the brand and associated labels. "To have a healthy, strong Capitol Records and Virgin Music is a good thing for the music industry. We will bring more investments by entrepreneurs and musicians than there have been for a long time. We will be doubling the A&R investment these labels have been making in recent years, and that will work its way through the industry ecosystem. What do you think this means for the industry? Please leave your comments and any links to other good articles below! America's Perception of the Creative Class: Where's the Love? Back in April, online publication Salon posted an article that took a close look at how the creative class seems to be viewed and portrayed by mainstream America. The over-arching theme of the article is that those in creative professions get no sympathy. They are seen as pampered and entitled, in the image of the few but widely publicized stars in their field. They are viewed "neither as the salt of the earth by the left, nor as a 'job creator' by the right." 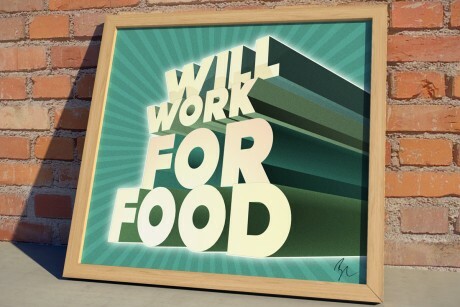 While jobs in the creative class were amongst the hardest hit during the years leading up to and during the Great Recession (“'Musical groups and artists' plummeted by 45.3 percent between August 2002 and August of 2011"), the sympathetic plight of the "working man" seems reserved for those in manufacturing, farming, or general "business". Somehow, the idea that artists are supposed to struggle has become a commonly accepted near-truism. Why is this? Why the disconnection and distinction between those in creative professions and those in more "tangible" professions? Scott Timberg of Salon explores several possible reasons, from the pragmatic principles of our country's early Puritan settlers to the falsely democratizing effects of technological innovation, in a wonderfully crafted editorial. Do yourself a favor and read this article. After all, in order to begin changing the discussions and perception that surround creative value, we must first try to understand where the existing assumptions come from. Many of you may be familiar with the concept of an Application Programming Interface, or API. For those that aren't, here's the basic idea: one company that controls a certain set of data provides to 3rd parties access to this data for specific uses. In practice, this allows 3rd party developers to create their own unique applications using the data they've been given access to. Those who control the data benefit from the extended distribution of this data. 3rd party developers benefit by having legitimate access to in-demand data sets upon which they can showcase and exploit their own engineering talents. 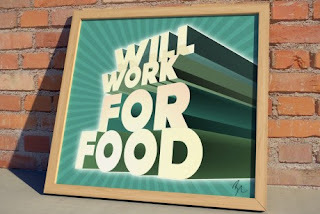 And consumer benefit by have more access to more creative applications that make their lives easier and more enjoyable. How are they used in music? APIs are used across the technology industry. They have been gaining notable traction with regard to digital music over the last few years as owners and licensees of music catalogs invite developers to create applications that use their music in new and interesting ways. At the end of last year, on-demand music streaming service Spotify announced the launch of its API platform, allowing "companies to build services and features atop Spotify's 15-million song music database". More recently, direct-to-fan music platform Topspin and the digital arm of music trade association NARM each announced new API initiatives of their own. 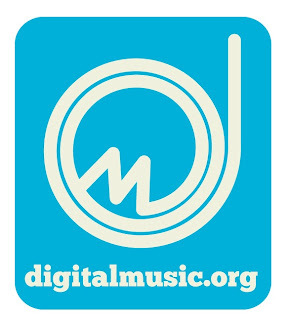 The "Music API Directory" from digitalmusic.org "gathers information on companies that provide APIs or other technology, features, and services that are essential to music-app developers of all kinds, including artists, labels, brands, and more. This information includes music-specific categories such as lyric providers, music identification technology, and playlist and recommendation services, as well as non-music categories such as social networking integration, location data, and game development. All this data is displayed in one centralized, searchable location, allowing developers to quickly and easily find exactly what they are looking for and speeding the creation of new music apps." It's a one-stop shop for music-related APIs! 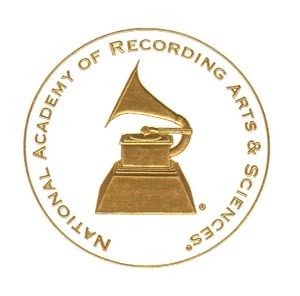 Last month, the Recording Academy officially launched a campaign to "Give Fans the Credit". In short, most digital music services provide very little information about the music they distribute. Consumers can see the artist name, song title, corresponding album...and that's about it. WHERE ARE THE DIGITAL LINER NOTES? For so many fans growing up listening to physical music products (vinyl, cassette, CD, etc), liner notes were a major part of the experience. They helped fans discover music by connecting the dots between artists, producers, songwriters and musicians. The Recording Academy wants to bring this experience into the digital age. Fans benefit from knowing who the key "players" are behind their favorite music, and these "players" benefit from increased exposure through the work they have such an integral role in creating. 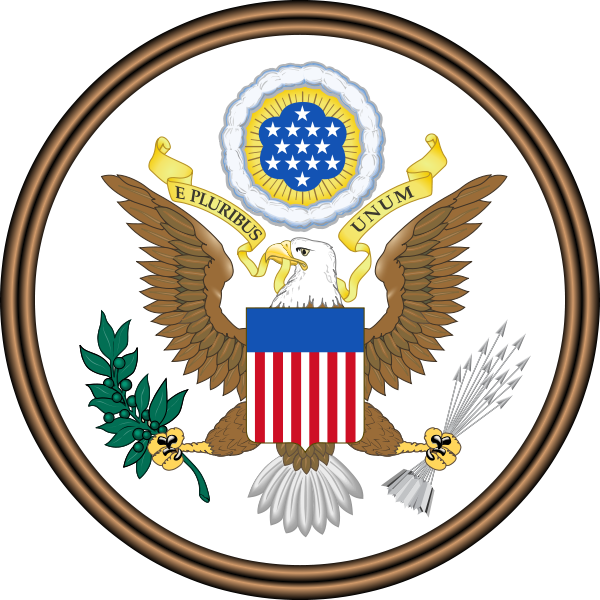 - The Statute of Anne, passed in 1710, established copyright protection in Great Britain but did not apply to the American colonies. 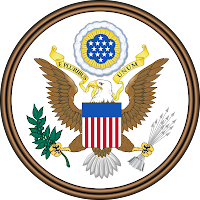 - Authors, including Joel Barlow and Noah Webster (of Webster's Dictionary fame) are largely responsible for lobbying the many levels and incarnations of government to support the idea of copyright in the colonies and eventually the United States of America. - William Billings, a controversial but widely popular songwriter during the second half of the 18th century, was the first author (rather than a printer or bookseller), to apply for the exclusive privilege to sell and distribute his own work (a book of music that he had composed). He did so by petitioning the Massachusetts House of Representatives in November of 1770, and while he was able to convince the legislature to pass a bill in his favor, it was ultimately vetoed by the loyalist Massachusetts governor. While Billings's efforts set the tone for many important pro-author copyright decisions to come, he himself "never escaped poverty during his life. He was buried in an unmarked grave even though his music remained popular, reprinted freely without compensation throughout the States." If you approach the marketing of your band, brand or business as just another "to do" on your task list, you may need to re-think your approach. 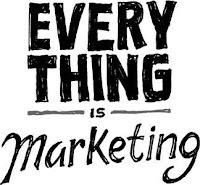 Taking inspiration from the book REWORK by the founders of the company 37 Signals, music PR blog Ariel Publicity elaborates on the idea that "everything is marketing" with a list of "10 Ways You Are Unknowingly Marketing To Your Fans". Here's the takeaway: from your choice of words used in emails and social media posts to the way you dress, interact with fans, handle criticism, approach your songwriting and more, a successful brand is made by truly living out the vision for what you want it to be. Everything you do is an extension of your brand. 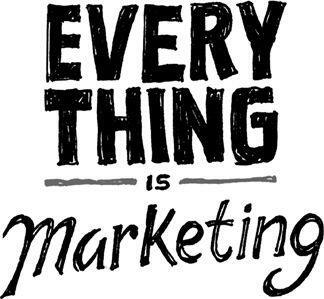 Marketing should not be a job, but instead should be the essence of how you approach your entire business. Please note, this is by no means an exhaustive list, but instead a jumping off point to start thinking about how one can better build their brand. Feel free to share other thoughts and ideas below! Last month Nielsen released the results of their "Music 360" study - a survey of 3,000 individuals that covers topics including "where/when music is consumed, through which device(s), apps and services; digital vs. physical purchases; the process of discovery, and how/when discovery converts to purchase; insights around spending, share of wallet, and retailer preferences; live events; and much more." One of the more notable publicly released statistics says that amongst teens, YouTube (at 64%) is the most popular source for music consumption. 64% of teens listen to music through YouTube. This is a remarkable penetration figure and goes to show that YouTube, while not marketed directly as such, is in fact a music service. 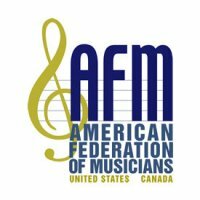 Ray Hair, International President of the American Federation of Musicians, recently spoke out in response to internet radio legislation currently being crafted in Congress. Led by Rep. Jason Chaffetz (R-Utah), the "Internet Radio Fairness Act of 2012" aims to level the playing field for digital radio services by holding them all to the same set of standards when determining the royalty rates that they are required to pay to content owners (currently, internet radio services are required to pay much higher rates than satellite or cable radio services). While the concept seems fair in principle, the initially proposed solution calls for a reduction in the royalties paid by internet radio services to align with the lower rates paid by satellite and cable services. If passed, this would be a major setback for content owners. As Hair notes, "instead of ensuring that terrestrial radio stations pay musicians fairly – just as many digital radio stations already do – it would allow the digital platforms to pay musicians less too, at rates far below market value. The bill would effectively unleash a race to the bottom, with radio platforms competing to see which can pay musicians the least. Rather than emulating the one corner of the digital music industry that seeks to give artists their fair share, it attacks that example at the expense of struggling artists -- all with the goal of further enriching companies that already make their money off artists’ backs." Hair goes on to make several other arguments in favor of more pro-artist solution to radio royalty equity, and includes terrestrial radio broadcasters (who currently pay nothing to recording artists and labels, unlike digital services who pay songwriters, publishers, artists and labels) in his challenge to "support the musicians that give life to the songs we love, and bring joy to the world." As Hair states, "paying musicians isn’t an inconvenience to radio’s business model – it’s an essential part of it." With so much discussion and debate taking place between copyright supporters and free culture advocates, it's easy to lose sight of the founding principles, key pieces of legislation, landmark court decisions and cultural relevance (both historically and currently) associated with the protection of intellectual property. Facts are often distorted or blown out of proportion, assumptions are made without questioning their accuracy and focus is given only to points that serve one's pre-determined perspective. With that in mind, it's important to take a step back and make an effort to become familiar with the truths behind copyright policy. 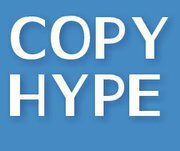 Copyhype recently posted a wonderful summary and collection of seven different law reviews that explore and debunk many of the most popular myths about copyright. Topics covered include the length of copyright protection (and the Sonny Bono CTEA of 1998), private interests vs. public good, the implications of copyright in the digital age and the socio-economic ramifications of the copyright system. These are in-depth reviews, not all to be read in one sitting. But it's important information for any advocate (one way or another) to be aware of. So please, bookmark the site, read what you can, and keep coming back to chip away at some more. We'll certainly be doing the same! 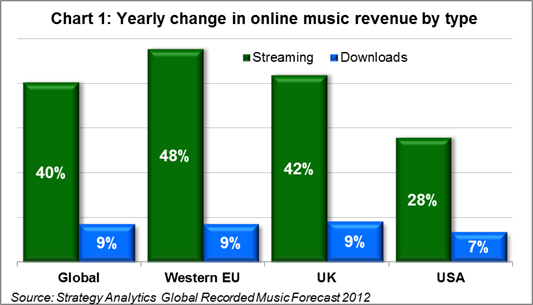 - In 2012, global streaming revenues will increase 40% over 2011, with downloads only increasing 8.5%. In dollars, streaming will add an additional $311 million to the pie, with downloads adding an extra $303 million. Downloads still make up the majority of digital revenues ($3.9 billion to streaming's $1.1 billion), but streaming is now the leading revenue growth engine. - Digital music will now account for 39% of the global music market, and is expected to cross 50% (thus overtaking physical as the dominant format) in 2015 (Note: the US, Sweden, South Korea and some others have already reached this milestone in their respective countries).